Place your forefinger on each egg in the carton, and move it slightly. If there is no resistance more than likely it does not have a crack. This is a guide about how to test eggs for cracks. We've all seen people opening a carton of eggs prior to purchasing. Most of us have done the same. We're checking to make sure there are no cracked eggs in the carton. I carry this one step further. To the casual onlooker, it would appear as though I was counting the eggs; when obvious by mere sight, there are twelve. 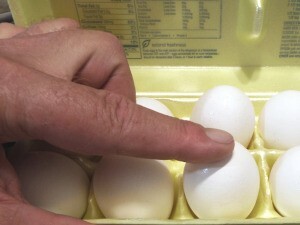 I place a forefinger on each egg, moving it slightly. It takes all of about 5 seconds to check the dozen eggs. If the eggs move freely, all is well. If my finger meets resistance, more than likely an egg is cracked. Often with a cracked egg, there will be a little seepage of egg white. On the shelf, that white would dry, causing the egg shell to stick to the carton. I'm sure, if Ms Child was with us today, she would wholeheartedly agree; eggs are susceptible to cracks at either end. Good tip. I also take a quick glance at the bottom to see if there is moisture from a cracked, drippy egg. GREAT TIP NEVER HEARD THAT ONE BEFORE. WORTH SHARING.